The item 56 up, (electronic resource) represents a specific, individual, material embodiment of a distinct intellectual or artistic creation found in Kent District Library. "Give me the child until he is seven and I will give you the man." Starting in 1964 with Seven Up, The UP Series has explored this Jesuit maxim. The original concept was to interview 14 children from diverse backgrounds from all over England, asking them about their lives and their dreams for the future. 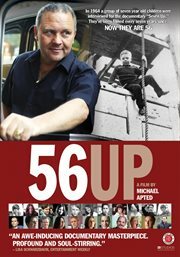 Every seven years, renowned director Michael Apted, a researcher for Seven Up, has been back to talk to them, examining the progression of their lives. From cab driver Tony to schoolmates Jackie, Lynn and Susan and the enigmatic Neil, as they turn 56 more life-changing decisions and surprising developments are revealed. An extraordinary look at the structure of life in the 20th century, The UP Series is, according to critic Roger Ebert, "an inspired, almost noble use of the film medium. Apted penetrates to the central mystery of life."